As America's population ages, we are increasingly confronted with the failure of our elder care system. Dr. Bill Thomas has made it his life's work to change how society approaches aging. As America’s population ages, we are increasingly confronted with the failure of our elder care system. Dr. Bill Thomas has made it his life’s work to change how society approaches aging. Dr. Thomas is a professor at the Erickson School at the University of Maryland, Baltimore County. 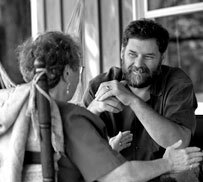 He is the founder of the Eden Alternative, a philosophy and program that has worked to de-institutionalize nursing homes for the past 20 years. He has developed the Green House, an alternative to nursing homes in which small groups of people live a full life in a home-like setting. He joined Marc in the studio today to discuss his vision for a country with no nursing homes, his books, and what he thinks we can do to reform the health care system and ensure the best care for older Americans. Visit Dr. Thomas’s blog, Changing Aging, to read more about his work.